Earn $1.95 in VIP credit (195 points)What's This? 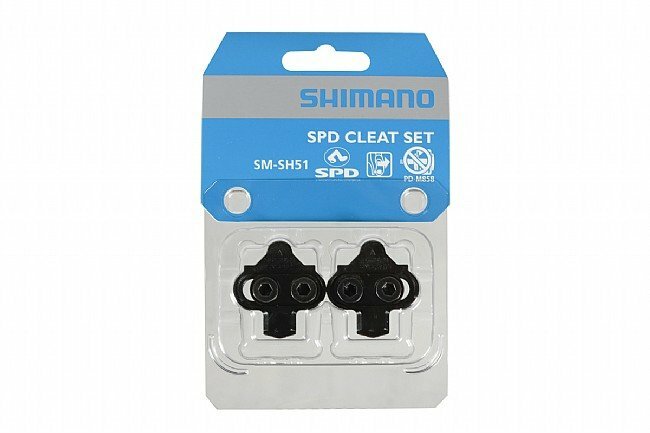 Replacement cleats for Shimano SPD pedals (two-bolt side-to-side). NOT for SPD-SL or SPD-R pedals. Works with all Shimano SPD pedals except for PD-M858. Single release only releases when swinging the heel outward away from the bike limiting accidental un-clipping. Hardware included. Black. IN THE WORLD OF CYCLING THE SKY'S THE LIMIT IN ALL CATAGORIES OF COMPONENTRY BUT THESE LITTLE BEAUTIES ARE IN MY OPINION THE BEST A CYCLIST CAN GET. I DO A LOT OF COMMUTING, TOURING AND EVERYTHING UNGER THE SUN ON MY BIKES AND I NEED TO BE ABLE TO WALK AROUND WHEN I'M OUT AND ABOUT. MTB SHOES GIVE ME 95% OF THE PERFORMANCE THAT ROAD SHOES OFFER AND A GOOD 500% MORE COMFORT OVER ROAD SHOES. I HAVE A FEW BIKES ALL OF WHICH COST OVER FOUR THOUSAND DOLLARS BUT I ALWAYS USE MTB SHES FOR COMFORT. I LIKE SHIMANO XTR TRAIL PEDALS AND HAVE THEM ON ALL MY BIKES. UNLESS YOUR A PRO RIDER ROAD SHOES AREN'T NECCESSARY IN MY HUMBLE OPINION. THESE ARE CHEAP CLEATS AND WORK EVERY TIME, BIG FAN OF THEM!!! Easy to install and they work. I expect they will work 20 years like the last ones. They're Shimano cleats and they work perfectly with my old road SPD pedals. The price was right and the delivery was quick. What more needs to be said? These work just like they should. Perfectly functional, as expected, as a reasonable price. No surprises...just a good, solid cleat for mountain riders. They go on my spinning shoes and they are great. At first I had to get used to them but once I got the hang of it, that's it!! I go fast!! There IS a difference between Shimano cleats and aftermarket versions. I installed an aftermarket cleat on a pair of shoes, and noticed immediately that there was almost no float. Also, much more difficult to clip in and out. A pair of these Shimano cleats fixed it all. Get the real deal. I will be using SPD style pedals forever. No complaints. I don't know how long they will last but they seem to be holding up better than the cleats I used when I had Crankbrothers eggbeaters. I put them on my Lake Boots and on my Sidi Mtn Bike shoes in about 10 minutes. They do eventually wear out or needed for new shoes! Position well and enjoy the connection. Each time I get a new pair of cycling shoes, new cleats get installed. They are cheap, and get the job done. I am tired of messing with my old used cleats- usually the bolts are all janky and gunked, thus the reason it's nice to install new ones. This is my first choice for a SPD cleat. Universal, basic, and great performance. Stay secure when riding,easy clip out when needed. Like the fact that you can walk in the shoes that use them. I'm liking the Shimano SPD pedals more and more esp. the dual sided models. They are so convenient on my commutes where it involves lots of clipping in and out. I have 3 pairs of shoes with these cleats and they all work well exactly the same. All 3 are the single point release but I've had no problem releasingwhen I had to but also no accidental releases. One time, in a slow turn, my front wheel slipped out on a wet stone surface and my foot popped out no problem saving myself from an embarrassing situation. These were a bargain on sale at BTD. Shimano is Shimano. Great replacement cleats. Works great for my spin classes 3-4 times per week. New cleats after 12,000 miles! Probably could have used them longer, but new ones have less play. No twist or movement. Nice and tight on the pedal.